Uruguay : When and where to go? Temperate, the climate allows winters (from June to September) rather mild, with average temperatures between 10 and 16 ° C, and summers (from December to March) pleasant (between 21 and 28 ° C), Fresh in the interior than on the beaches, where the humidity is sometimes stifling. Summer is the best time to enjoy the whole country, although there are many tourists. 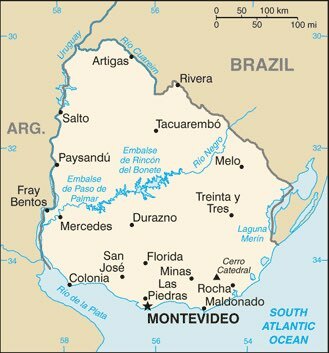 Montevideo, the capital, is located on the banks of the Rio de la Plata. It has an architecture where flourish the Spanish and Italian styles, as well as Art Deco touches. You can stroll through the old town, or even better, take a long walk that takes you from the Plaza Independencia to the port, and discover on this occasion sites worthy of interest, such as the Mausoleum of Artigas marble The Palacio Salvo which is the city's tallest building, the neo-classical town hall, and the National History Museum. Also visit the lively Mercado del Puerto and the open air market of Tristan Narvaja Feria. The coast to the east of Montevideo has several seaside resorts, such as Atlantida or Piriapolis, and this area is strongly influenced by the West. The best known of all, Punta del Este, offers tourists marinas and golf courses, but also beautiful beaches. From here, you can drive to Gorriti Island with its ruined fortress dating back to the 17th century. The island of Lobos shelters in its natural reserve a protected population of sea lions. Also to be discovered is the village of Aguas Dulces, a small fishing port in the quiet, very simple, where you will taste in peace of the delicious seafood; Tacuarambo, a peaceful and shady town, where sculptors have worked on many statues scattered in every corner; The agricultural estancias of the center of the country. As an EU citizen, you do not need a visa to enter Uruguay, if your stay is less than 90 days. The current currency is the Uruguayan peso (UYP). It takes about twenty hours to connect Paris to Montevideo, with one or often two stopovers. To travel in the country, buses are frequent and inexpensive. In Montevideo you will use taxis. If you are driving, you will use a well-developed road network in good condition. Budget: although this country is one of the most expensive in Latin America, prices are quite low. You can eat properly for an average price of 15 €, and rent a room for about 20 euros. Health: there are few health risks in this country, so it is simply advisable to have your current vaccinations up to date and to take remedies against the turista, which is rather less frequent than in the neighboring countries. Security: Uruguay is a safe country. Just take the usual precautions in big cities, especially at night. Local craftsmen use wood and silver a lot, so you can bring wooden carvings, silver jewelery, and painted or engraved calabashes from your trip.